Over the years, I’ve tried to figure out the perfect most reasonable dietary balance for my kids. Of course, I want them to eat healthy, but I also want to let them be kids — have fun junk food once in a while. But it is such a slippery slope. I mean, bad-for-you-food is everywhere. And because I know how harmful it can be on their bodies, it’s hard for me to allow it as often as it’s available to them which is almost daily. At the same time, I don’t want to deprive them. But we do make fun treats around here quite often. Good thing Alice likes to bake! Anyway, I feel like there is such judgement on what we feed our kids from all sides (too much junk vs. too little). But no one knows the “perfect” answer, and you know what? There isn’t one. Each family and each child is so different. I do think that trying to find balance with kids is just as important as the food they eat. For many of us, that balance can mean totally different things. We have to do what works for us, and you have to do what works for you and your family. For my family, that balance got a bit tricker years ago when I realized that my son was sensitive to gluten (not celiac, just intolerance) coupled with the fact that he and my daughter have my autoimmune genes that I pray never express. So how do I control what he/they eat all the time? The answer is…I don’t. Control isn’t the goal. 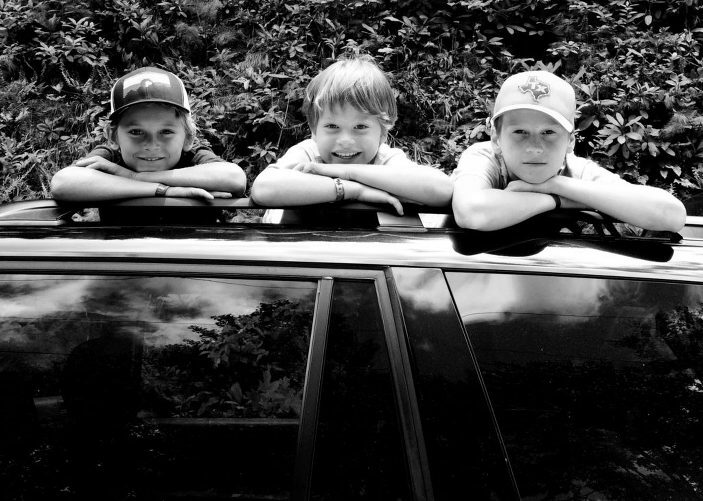 Tate is now 9 so it’s up to him to want to make good choice, and many times he will, but many times he won’t, and that’s okay. And the same with my daughter. They have to make their own decisions. I’m just hoping they make educated ones, and if not now, hopefully when they are older. I can control what they eat for breakfast, lunch, dinner and most of their snacks. They eat well enough with me that they know what it feels like to feel good, to be able to focus their best, and have lots of energy. So when they do eat out or choose a treat, they will understand how it may (or may not) affect them. My aim is to educate them — to make sure they recognize that the foods they eat can have a quick and direct effect on how they feel, how well they perform on a test, how much endurance they have in lacrosse, and how their moods can swing. And not by telling them. They need to feel it to get it. I think this is how they will learn to make choices beyond what tastes the best. 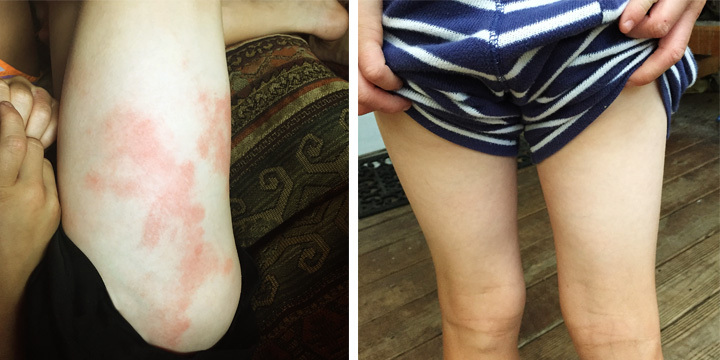 If you or your child is suffering from any of the above symptoms, this 3 week challenge can possibly give you some answers. I know three weeks might seem like a long time but it can be invaluable information. So will my kids go off to college one day and go crazy their freshman year? Very likely. But you know what, I grew up eating lots of junk and I went crazy too (at least I was eating fat free…ha 🙁 . But at least after they do go crazy, they will know what to do, how to find their balance, and how to feel good again. I wish I would have known back then. Real food sure would have tasted better than the Slim Shakes and fat free ranch with fat free pretzels (which only made me feel worse)! Gross…. 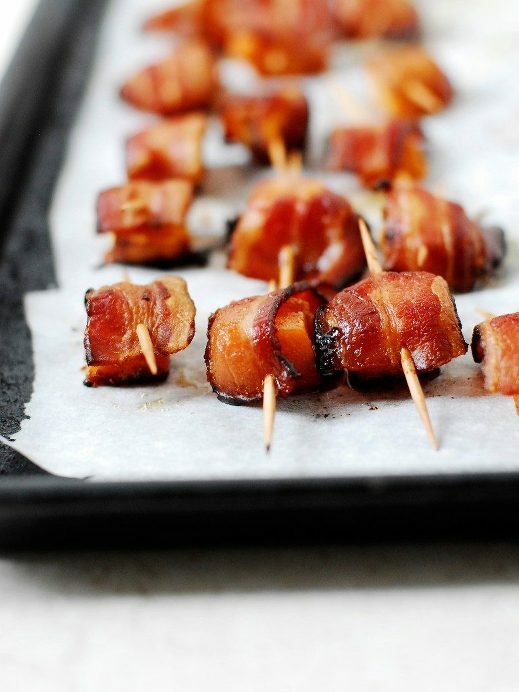 Okay, with the kids in mind, here is a recipe that they, everyone will love!! 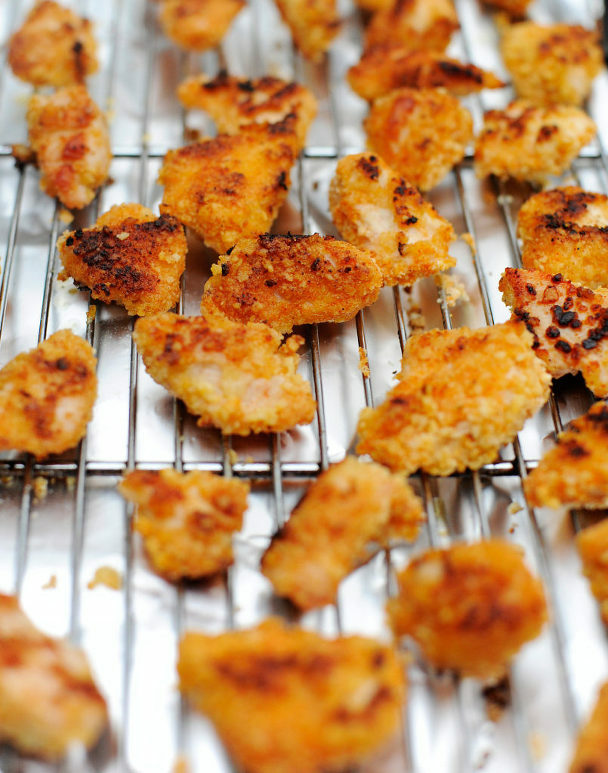 Over the years, I’ve made many chicken nuggets but these are best by far. I use to be such a Paleo purest when it came to food for the family that I got into the habit of just using low glycemic foods like almond and coconut flour. And while those “flours” have their merits and I still eat paleo a majority of the time. 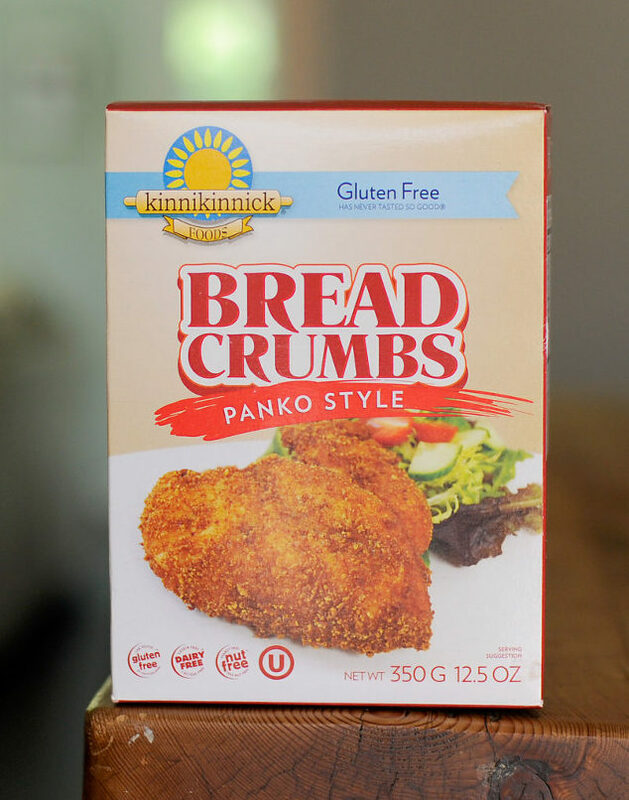 For something like “breading”, some gluten free bread crumbs go a long way. I hope y’all like them as much as we do! There is an extra step at the end that makes these things nice and crispy. and at first, I really did want to skip that step because as you may know, I am a pretty lazy cook. 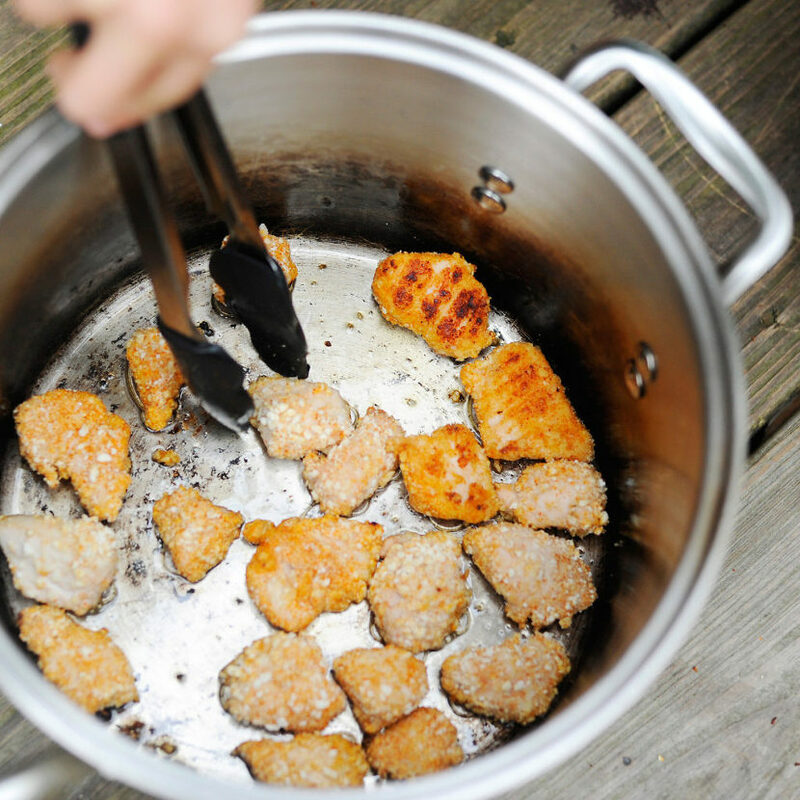 But the extra few minutes of frying makes these nuggets, have the texture of real nuggets! And, because I don’t want to cook two nights in a row (see I am lazy! ), I doubled the batch so last night we had nuggets and tonight, we will have chicken parmesan! Done and done! 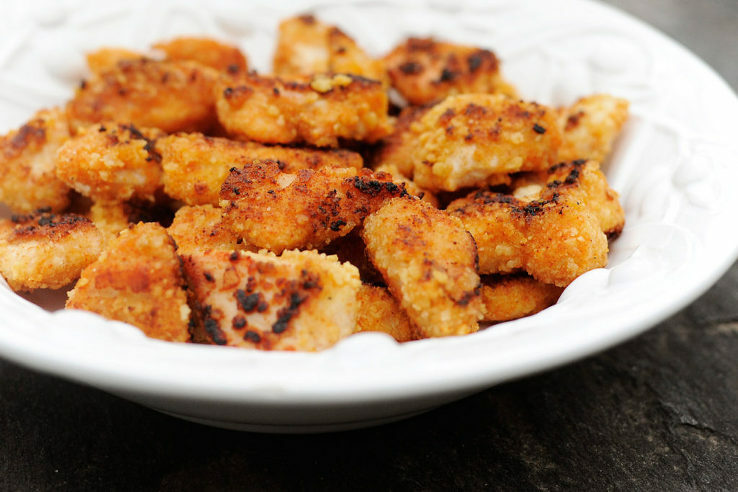 Wash and cut chicken into bite-sized pieces and set in a large bowl. Add coconut milk and lemon juice and let sit for at least 10 minutes. While that is sitting, get a gallon sized freezer bag and add the dry ingredients and shake to mix well. After letting the chicken sit for 10+ minutes (we let our sit for a few hours in the frige), get the chicken, place a colander in the sink and pour chicken into it to let the milk and lemon juice drain out. Add a few dashes of Pete's hot sauce and mix the chicken with it (if you want or you can skip this). Next add the chicken to the bag of dry ingredients and shake well. Spray a baking sheet (use a rack if you have one and spray that) and place the chicken spaced where it doesn't overlap. Get out a large pan, I used my 6 quart pot so the "frying" wouldn't splatter and make a huge mess. Heat the pan, or pot, on high and add 2 tbsp coconut oil or avocado oil. Place the chicken in the pan/pot and let cook for about 2-3 minutes on each side until it's a nice golden brown. 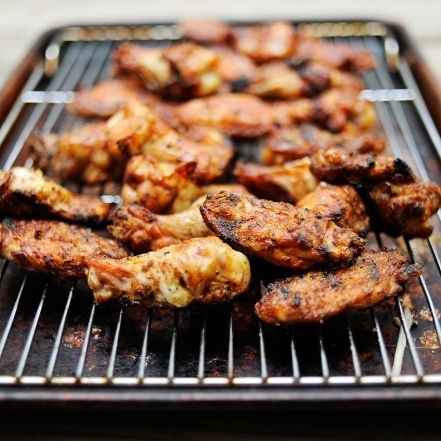 Take out the chicken, use a paper towel to wipe out the pan/pot and repeat until it's all cooked. I doubled the recipe so last night we had chicken nuggets and tonight, chicken parmesan! I love the Paleo diet (I hate the word “diet”) because it takes out the top allergen/inflammatory foods and it also promotes foods that are low glycemic (so you don’t raise insulin levels which in turn keeps inflammation at bay), allows your body to burn fat, and it also gives you a more steady stream of energy. I also think it is a great starting “diet” template for those wanting to reduce inflammation and improve their health. When people ask me about legumes, gluten free grains, corn and some other things that aren’t “Paleo”, I will always say it depends on you and your body. No one can say that one diet, food, or supplement is great for them so therefore it is great for everyone. Our bodies are all so unique, each responding differently (at different times in our lives) to what we put in them. So it’s up to us as individuals, if we want to feel our best, to figure out what makes our bodies happiest by REALLY listening and paying attention to symptoms (and not just gastrointestinal symptoms) that certain foods may cause. Those symptoms are the ways our bodies tell us what it likes and doesn’t like. So while the paleo diet is a great, after eating this way for some time our bodies have time to heal and inflammation subsides, it can be good to retest (by eating certain foods, one at a time, and looking for symptoms head-to-toe) to see how you react. But because I’m a rule follower, I sometimes forget to test and try new things by going outside of the “Paleo realm”. So after 8 years of eating very little dairy (which has some great health benefits only when there is not any kind of intolerance) and healing my gut, I felt it was time to test it out and see. 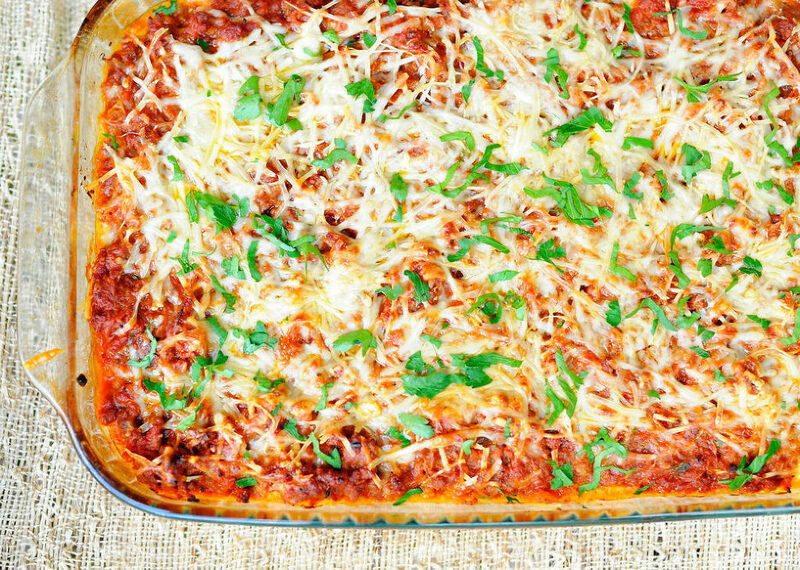 And I just so happened to be craving lasagna so all the more reason to test it out now. I wanted a traditional lasagna recipe but also wanted it to still be grain-free, but more importantly, for me, I wanted it lower glycemic (to still keep inflammation down), Anyway, after some playing around I came up with this Spaghetti Squash Lasagna recipe and it was AMAZING. I thought maybe it was just me since I hadn’t had dairy in so long but honestly, everyone in my family loved it! I was so excited I made it twice in two weeks…you know because I REALLY had to test this dairy!! It was just so good!!! So what were my results of my dairy challenge? It wasn’t the typical stomach symptoms that most of us think about when we think about food intolerances. For me, my nose became stuffy and I also had some post nasal drip or something like that where I couldn’t clear my throat. The good news is my symptoms weren’t huge but the bad news is I don’t want to go back to taking allergy/sinus medicine like I did from college until about 8 year ago before I changed my diet. Also, even though they are minor symptoms, I still have to remember there is a reason my body is creating this response so rather than ignore it (which will create inflammation over time), I choose to still limit my dairy, but I just won’t be quite as stingent as I was in the past which I feel like is a nice compromise so I can enjoy this delicous meal once in awhile. 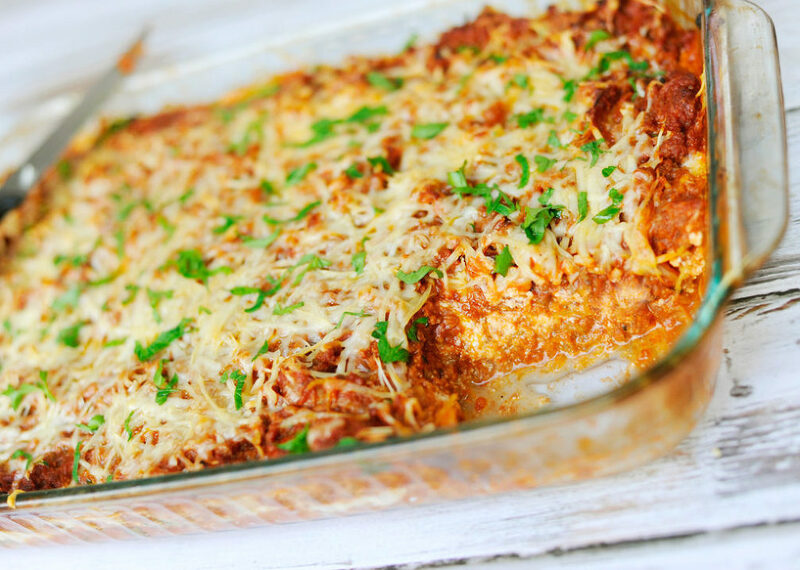 Place spaghetti squash cut side down on a baking sheet and bake for approximately 25 minutes or until the skin of the squash gives when you press on it. In a large pot, cook sausage, ground beef, over medium heat until well browned. Stir in spaghetti sauce to pot with sauage and beef and the grease, too. Simmer, covered, for about an hour, only if time permits. 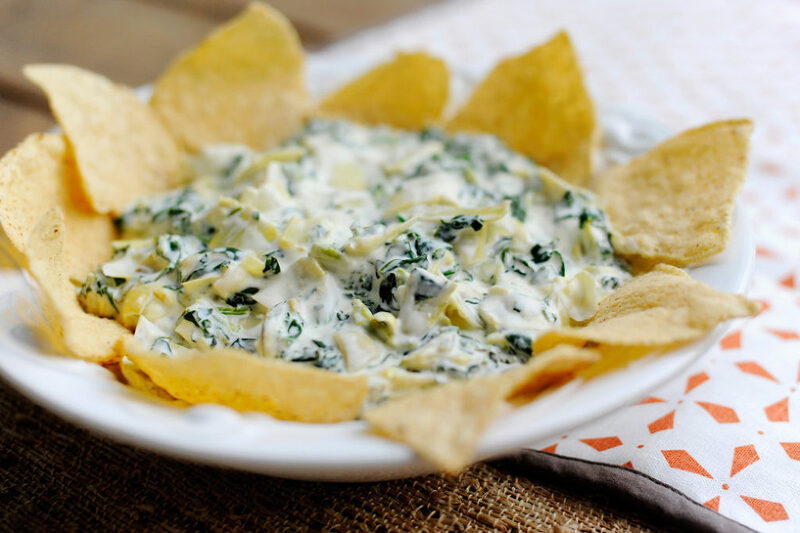 In a mixing bowl, combine ricotta cheese with egg, remaining parsley, and 1/2 tsp salt. Scrap the spaghetti squash and place in big pot of meat sauce. Still until combined throughly. 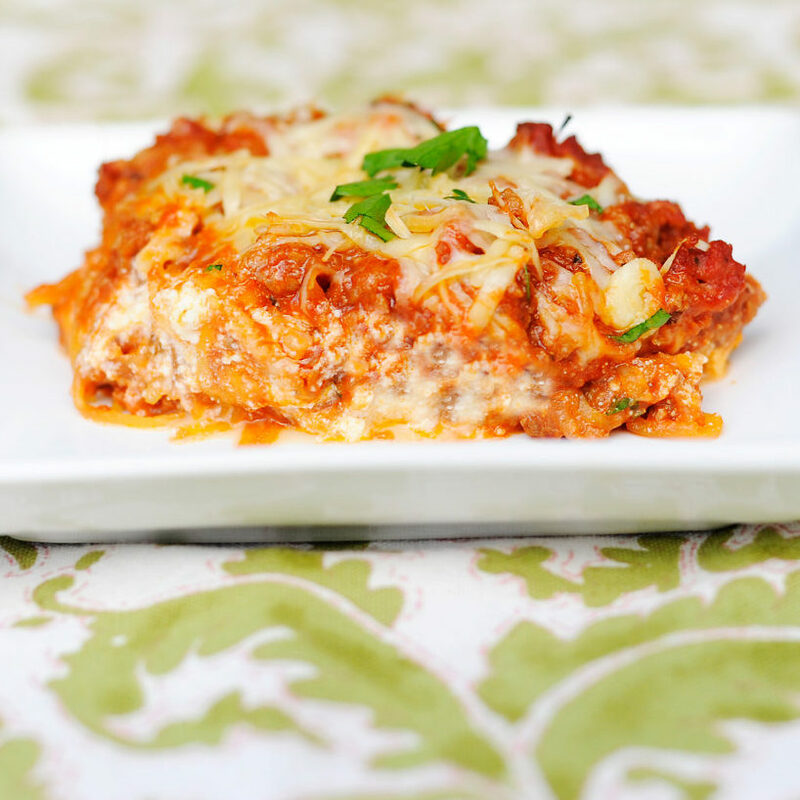 In your 9x13 baking dish, spread half of the meat sauce/spaghetti squash combo on the bottom. Then spread all of the ricotta mixture on top of that. Next,add a layer of mozzerala chese. Add the meat sauce back for the final layer and top with parmesan cheese. Bake for 40-45 minutes (until the cheese starts to brown). Hi This is Alice, Landria’s daughter. Since I made these cookies and my mom just got needles put into her elbow yesterday (gross, I hate needles) and typing is a pain right now for her, my mom thought I should write this post, so here it goes. This is my mom’s blog and she cooks a lot of great food, but I do most of the baking, and I love it! 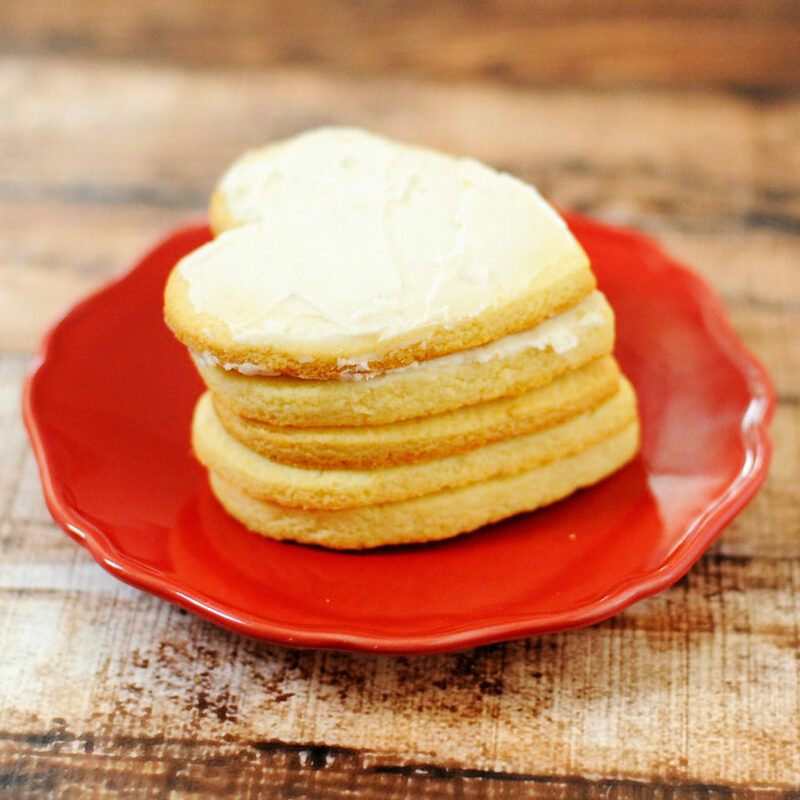 Sugar cookies are one of my favorite things to bake and I wanted to share this recipe. While I love the Paleo treats my mom makes, when it comes to flours, I really prefer the Cup4Cup gluten-free flour. My mom gets it from vitacost.com or Target usually. It tastes exactly like normal flours. In my math class if we have a test then we are allowed to bake something and bring it in and no one notices that my treats are gluten free! 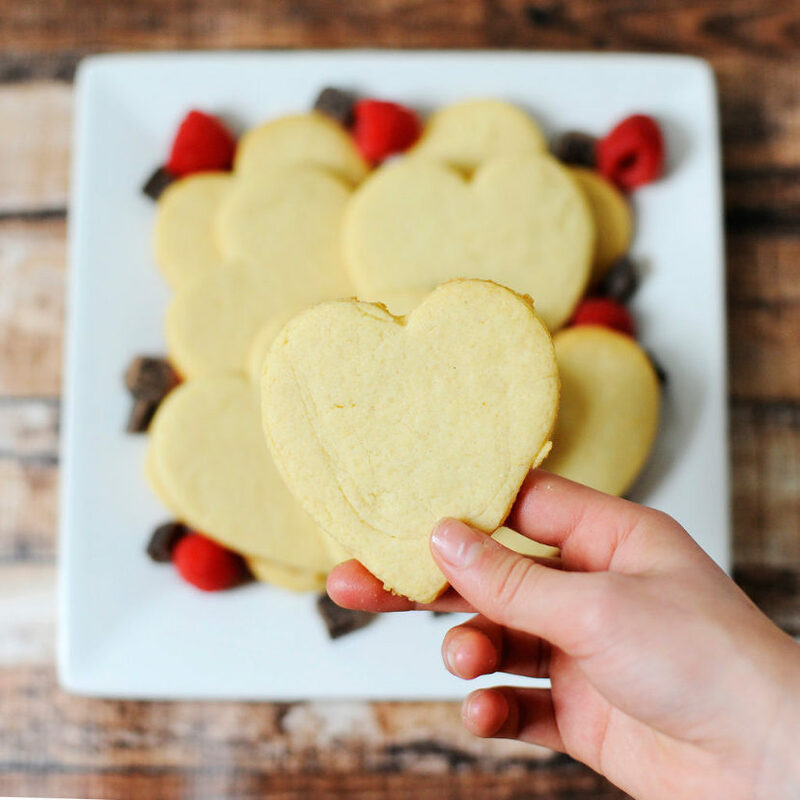 So if you are new to gluten free baking this is a good way to start. Hope you enjoy them! Happy Valentines Day! 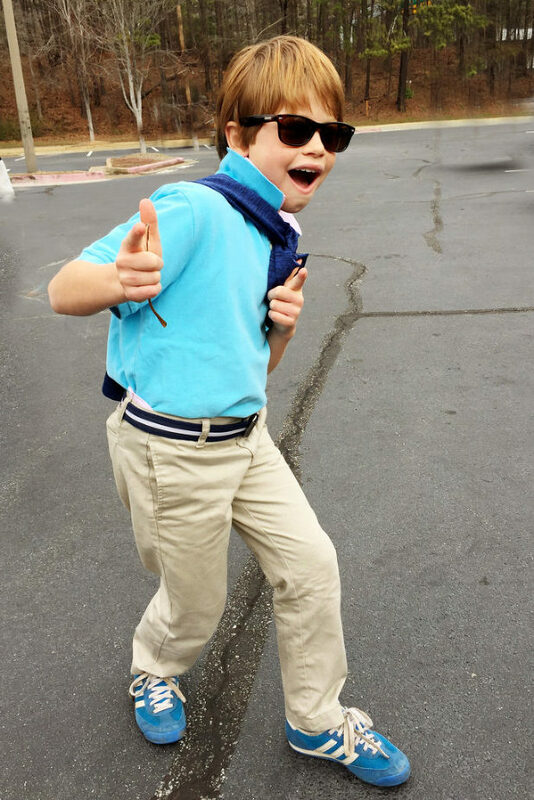 Happy 9th birthday to my dorky brother Tate! I love you! Beat soften butter and sugar together. Add dry ingredients to the mix. Add egg and vanilla and mix until the batter is smooth. 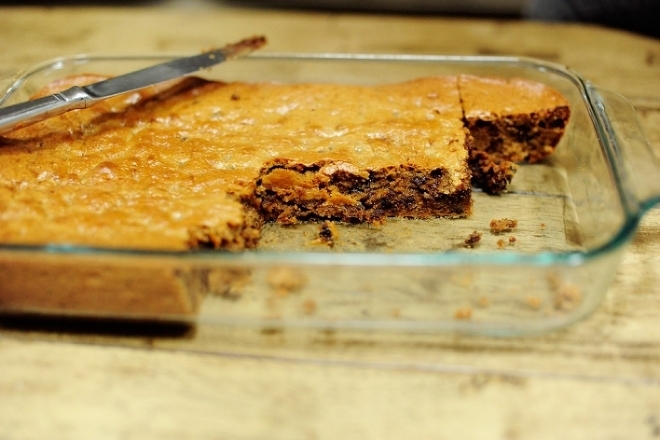 Place 1 tbsp cookie mix onto grease baking sheet and cook for approximately 12 minutes. 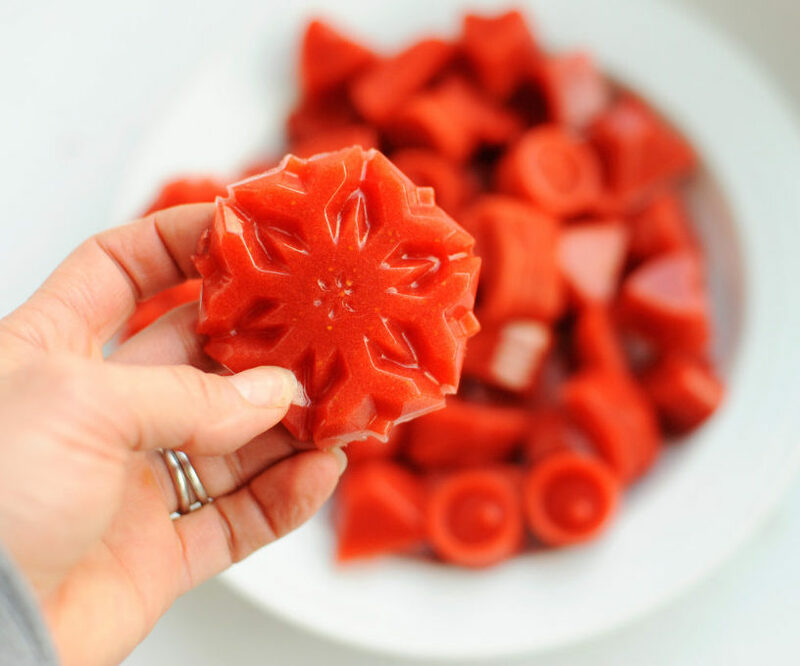 Do NOT try to use a cookie cutter on these. In full disclosure, the ones in the picture weren't as good as the ones I typically make (that won't work on the cookie cutter). 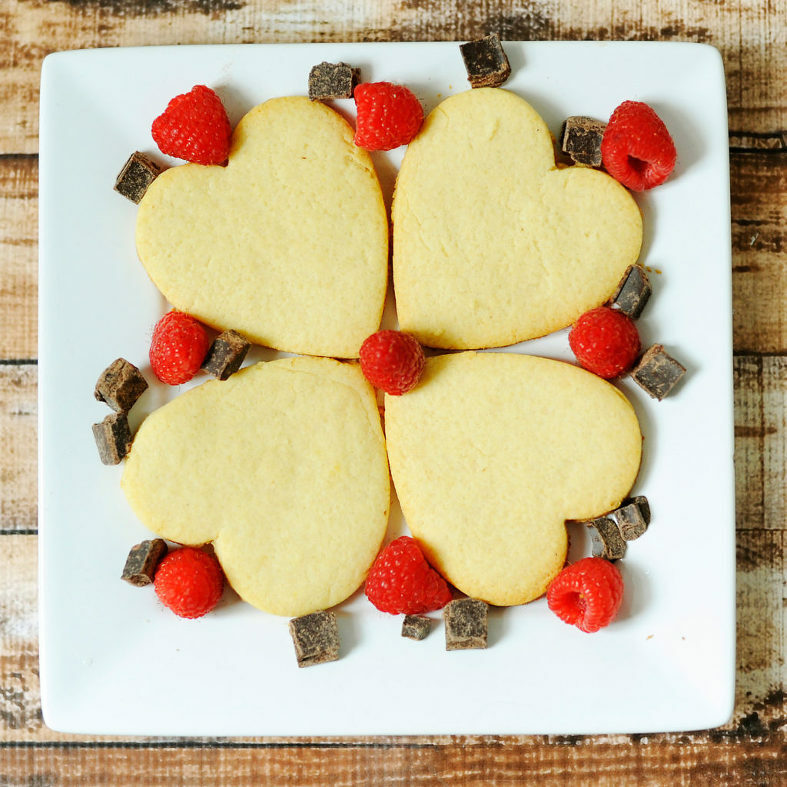 I want you to have the best tasting sugar cookies rather than the ones easiest to use with a cookie cutter. At times, I have a sweet tooth and just want a little something, and now that I am laying off of the chocolate (see my oxylate post) I wasn’t sure what to have. I’ve also been fighting tennis elbow for a little over 4 months, and with tennis season coming up, I feel desperate to do whatever it takes to get this thing healed. 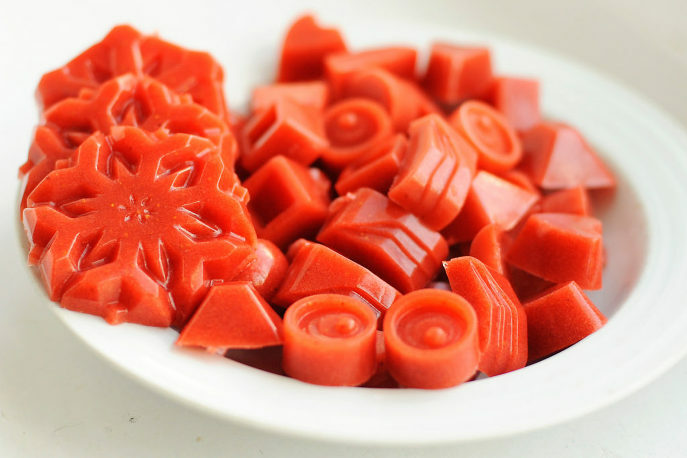 Anyway, I use to make collagen-filled gummies to have around in the summer, and I thought maybe they would both satisfy my sweet tooth and help with my elbow. So in the past week and a half, and I’ve already made them three times! I love going to the fridge and having one every now and then. Because we used berries, they are low sugar but still nice and sweet. Tate and I are addicted. And Alice, who claims she doesn’t like cooked fruit has been picking away at them. It’s only a matter of time before she loves them. 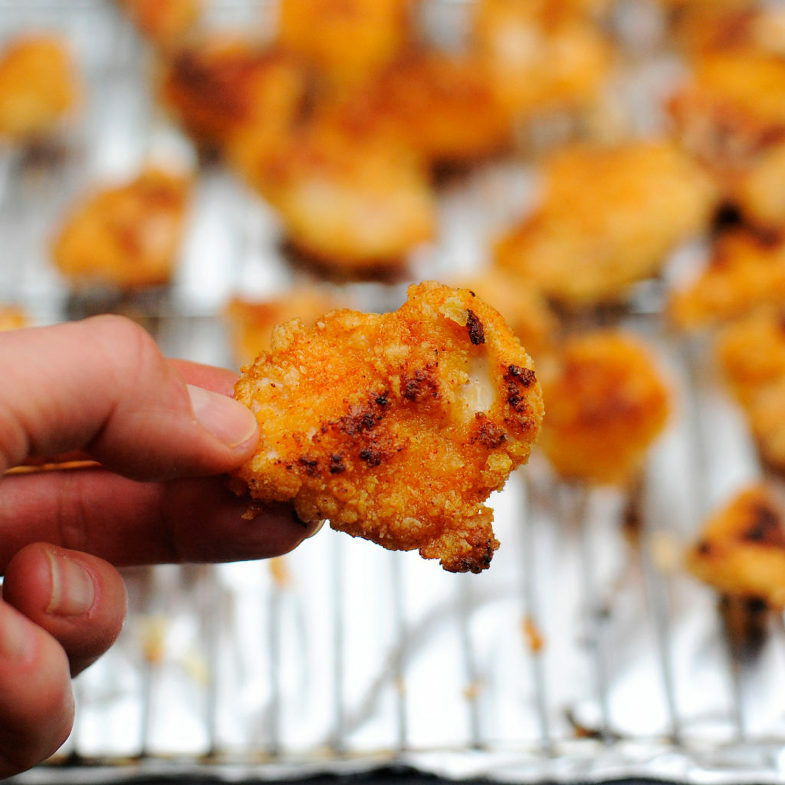 They’re in my book, Super Paleo Snacks, but we did tweak them a little and love the change. We were out of honey so instead we used maple syrup (and added an extra tbsp of maple). The collagen, which you can get on Amazon, along with my book :), has so many benefits (see my old post about collagen and gummies). Oh, and I really wanted to say, if you are one of the ones who has written a review for me on my book, I really want to thank you for the bottom of my heart. It’s funny, I see reviews come in on Amazon and each time, I just wish so badly I could personally thank the person for taking the time to write it. And then today I realized I can, well kind of, if they read this! So, truly, thank you!!! Look at how cool these things are…. 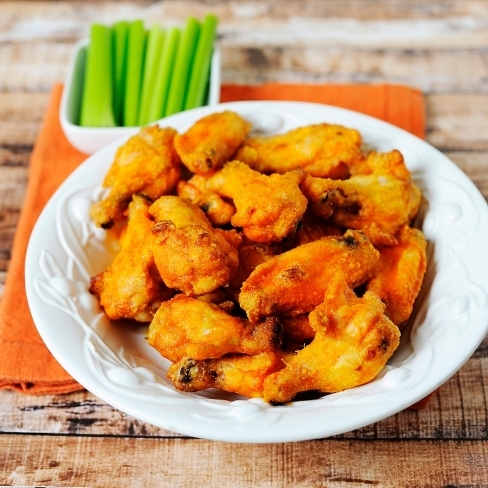 Okay, so of course the day before the Super Bowl I had to do a football food post, right? 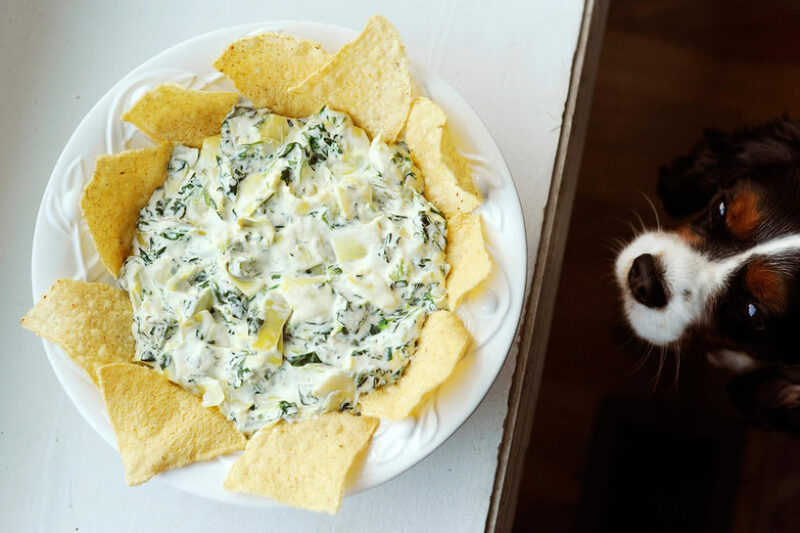 While this Spinach Artichoke Dip recipe does have dairy, it also isn’t from a packaged soup mix full of MSG, gluten and other nasties. 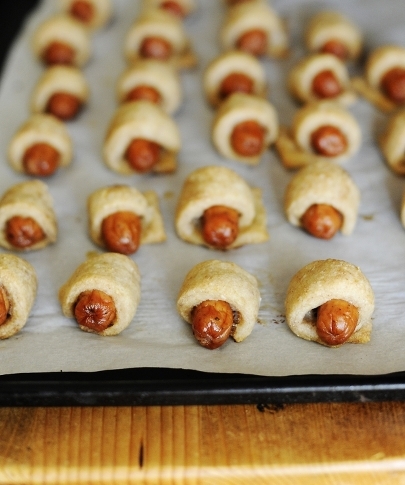 My family and friends love this recipe! Okay, maybe George isn’t as innocent as I originally thought…. I hope everyone has fun watching the Super Bowl tomorrow!! Go Falcons!!! Thaw spinach (can put in a pot with hot water) put in a pot and artichokes and drain any extra liquid.